Moving beyond a one-size-fits-all social strategy. By nature, social media sites are, well…social. That means that people use them for very personal and emotional reasons. Likewise, brands should have very different strategies for each channel. Especially at a time when Facebook is emphasizing more meaningful interactions, you should pause before posting the same exact content across all social channels. Your audience may be on multiple social channels, but they use each for unique reasons. For me, when it comes to LinkedIn and Twitter, I’m all business. But if a colleague tries to connect with me on Facebook or Instagram, they’ll have trouble finding my account. I reserve that for my family and close personal friendships. On Pinterest, I mix work with pleasure – featuring an eclectic mix of boards on beautiful UX design and inspiration for my 3 year old’s bedroom. And we know, from working with many high-tech B2B brands, that IT professionals in Europe and the Middle East tend to use Facebook for business networking rather than for the personal connections like we see in North America. If your audience has a unique reason for using each social outlet then you should have a unique marketing strategy for each. It was a place where we knew our audience congregated to share this kind of content. Pinterest’s boards allowed us to deliver the content in a format that helped reinforce the overall message: how SAP helps organizations uncover insights that tell a larger story about their business. 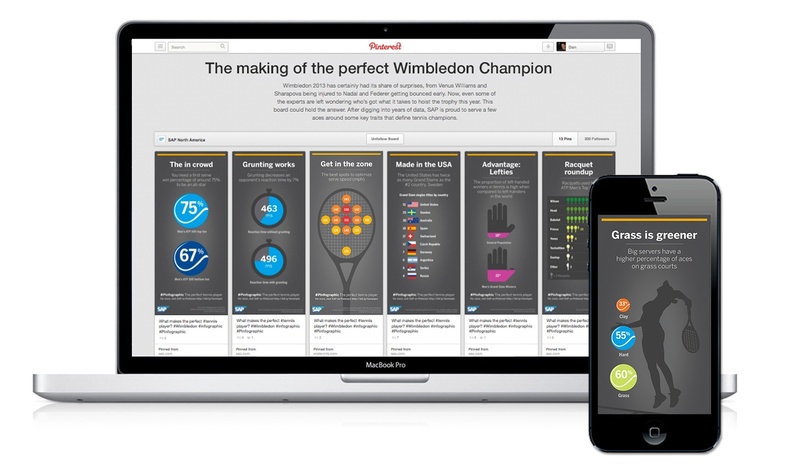 The resulting Pinfographic was a series of mini-infographics in the form of individual pins assembled together to tell a larger story about what makes a true tennis champ. By taking time to consider the psychology behind why your audience uses each social channel (and putting it into a formal strategy), you’ll make it easier to choose the right channels for your marketing programs. When and where are they accessing these channels? At work? On the way to work? At home? How are they accessing these channels? On a desktop? On a mobile device? What type of information are they seeking? Industry trends and news? Social connections? Business networking? Inspiration? What action can you expect from them? For example, on Facebook, do they tend to like but rarely comment? What are they talking about? Pulling sample Tweets and Facebook posts from your audience can offer great insights into the types of content they share. Once you’ve identified how and why your audience uses these top social channels, incorporate it into your overall B2Me strategy, audience personas, and journey maps. Not only will it help you promote the right content in the right social circles, but it will also allow you to prioritize and focus your social efforts. By developing a close, meaningful relationship with the channels that matter most to your audience, social media will stop feeling like the “cool clique” that you just can’t seem to get to notice you.